A painting by the American Edward Hicks (1780–1849), showing the animals boarding Noah's Ark two by two. 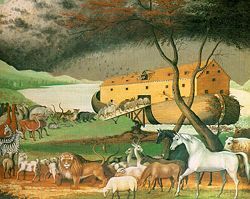 According to the Abrahamic religions, Noah's Ark was a large ship built at God's command to save Noah, his family, and a pair of all animals from the Great Flood. The story is recounted in the Torah's Book of Genesis (Chapters 6-9), with later variations found in the Qur'an and in a number of other sources. These texts state that God decided to destroy humankind due to its wickedness. However, God selected Noah, a man "righteous in his generation," to build an ark and to take on board his family and representatives of all the animals and birds. God's then destroyed the remaining life on earth through a massive flood, saving only those on the ark. Eventually, the waters abated and dry land reappeared. The story ends with God entering into a covenant with Noah and his descendants that is sealed by a rainbow. In recent times, the story of Noah's Ark has been questioned, doubted, and even ridiculed by both Jewish and Christian commentators and scholars. Nevertheless, Biblical literalists today continue to take the Ark as test-case for their understanding of the Bible, and to explore the region of the mountains of Ararat in northeast Turkey where Genesis says Noah's Ark came to rest. Michelangelo Buonarroti, The Deluge, Sistine Chapel, the Vatican. The story of Noah's Ark, according to chapters 6 to 9 in the Book of Genesis, begins with God observing mankind's evil behaviour and deciding to flood the earth and destroy all life. However, God found one good man, Noah, "a righteous man, blameless among the people of his time," and decided that he would carry forth the lineage of man. God told Noah to make an ark, and to bring with him his wife, and his sons Shem, Ham, and Japheth, and their wives. Additionally, he was told to bring examples of all animals and birds, male and female. In order to provide sustenance, he was told to bring and store food. Noah and his family and the animals entered the Ark, and "the same day were all the fountains of the great deep broken up, and the windows of heaven were opened, and the rain was upon the earth forty days and forty nights." The flood covered even the highest mountains to a depth of more than 6 metres (20 ft), and all creatures died; only Noah and those with him on the Ark were left alive. The Flood story is considered by many modern scholars to consist of two slightly different interwoven accounts, hence the apparent uncertainty regarding the duration of the flood (40 or 150 days) and the number of animals taken on board Noah's Ark (2 of each kind, or 7 pairs of some kinds). Eventually, the Ark came to rest on the mountains of Ararat. The waters continued to recede, and the hilltops emerged. Noah sent out a raven which "went to and fro until the waters were dried up from the earth." Next, Noah sent a dove out, but it returned having found nowhere to land. After a further seven days, Noah again sent out the dove, and it returned with an olive leaf in its beak, and he knew that the waters had subsided. Noah waited seven days more and sent out the dove once more, and this time it did not return. Then he and his family and all the animals left the Ark, and Noah made a sacrifice to God, and God resolved that he would never again curse the ground because of man, nor destroy all life on it in this manner. In order to remember this promise, God put a rainbow in the clouds, saying, "Whenever I bring clouds over the earth and the rainbow appears in the clouds, I will see it and remember the everlasting covenant between God and all living creatures of every kind on the earth." Noah descending from the mountains of Ararat. 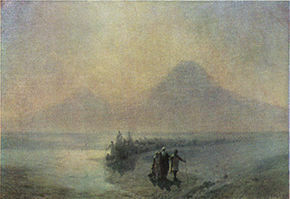 Painting by Hovhannes Ayvazovsky (1889). The story of Noah and the Ark was subject to much discussion in later Jewish Rabbinic literature. Noah's failure to warn others of the coming flood was widely seen as casting doubt on his righteousness—was he perhaps only righteous by the lights of his own evil generation? According to one tradition, he had in fact passed on God's warning, planting cedars one hundred and twenty years before the Deluge so that the sinful could see and be urged to amend their ways. In order to protect Noah and his family, God placed lions and other ferocious animals to guard them from the wicked who mocked them and offered them violence. According to one midrash, it was God, or the angels, who gathered the animals to the Ark, together with their food. As there had been no need to distinguish between clean and unclean animals before this time, the clean animals made themselves known by kneeling before Noah as they entered the Ark. A differing opinion said that the Ark itself distinguished clean from unclean, admitting seven of the first and two of the second. Noah was engaged both day and night in feeding and caring for the animals, and did not sleep for the entire year aboard the Ark. The animals were the best of their species, and so behaved with utmost goodness. They abstained from procreation, so that the number of creatures that disembarked was exactly equal to the number that embarked. The raven created problems, refusing to go out of the Ark when Noah sent it forth and accusing the Patriarch of wishing to destroy its race, but as the commentators pointed out, God wished to save the raven, for its descendants were destined to feed the prophet Elijah. Refuse was stored on the lowest of the Ark's three decks, humans and clean beasts on the second, and the unclean animals and birds on the top. A differing opinion placed the refuse in the utmost story, from where it was shovelled into the sea through a trapdoor. Precious stones, bright as midday, provided light, and God ensured that food was kept fresh. The giant Og, king of Bashan, was among those saved, but owing to his size had to remain outside, Noah passing him food through a hole cut into the wall of the Ark. Construction of the Ark. Nuremberg Chronicle (1493). Early Christian writers discovered elaborate allegorical meanings for Noah and the Ark. In the First Epistle of Peter those saved by the Ark from the waters of the Flood are said to prefigure the salvation of Christians through baptism, and the Anglican rite of baptism still asks God, "who of thy great mercy didst save Noah," to receive into the Church the infant about to be baptised. Early Christian artists frequently depicted Noah standing in a small box on the waves, symbolising God saving the Church as it persevered through turmoil, and Sain. Augustine of Hippo (354–430), in City of God, demonstrated that the dimensions of the Ark corresponded to the dimensions of the human body, which is the body of Christ, which is the Church. Saint Jerome (c. 347–420) called the raven, which was sent forth and did not return, the "foul bird of wickedness" expelled by baptism; more enduringly, the dove and olive branch came to symbolize the Holy Spirit and the hope of salvation and, eventually, peace. Saint Hippolytus of Rome, (d. 235), seeking to demonstrate that "the ark was a symbol of the Christ who was expected," stated that the vessel had its door on the east side, that the bones of Adam were brought aboard together with gold, frankincense and myrrh, and that the Ark floated to and fro in the four directions on the waters, making the sign of the cross, before eventually landing on Mount Kardu "in the east, in the land of the sons of Raban, and the Orientals call it Mount Godash; the Arabians and Persians call it Ararat". On a more practical plane, Hippolytus (c. 170 - c. 236) explained that the ark was built in three stories, the lowest for wild beasts, the middle for birds and domestic animals, and the top level for humans, and that the male animals were separated from the females by sharp stakes to help maintain the prohibition against cohabitation aboard the vessel. Similarly dwelling on practical matters, Origen (c. 182–251), responding to a critic who doubted that the Ark could contain all the animals in the world, countered with a learned argument about cubits, holding that Moses, the traditional author of the book of Genesis, had been brought up in Egypt and would therefore have used the larger Egyptian cubit. He also fixed the shape of the Ark as a truncated pyramid, rectangular rather than square at its base, and tapering to a square peak one cubit on a side; it was not until the twelfth century that it came to be thought of as a rectangular box with a sloping roof. Ibn Battuta, 1304–1377, the Moroccan world-traveller who passed by the mountain of al-Judi, near Mosul, resting place of the Ark in Islamic tradition. Noah (Nuh) is one of the five principal prophets of Islam, generally mentioned in connection with the fate of those who refuse to listen to the Word. References are scattered through the Qur'an, with the fullest account at surah 11:27–51, entitled "Hud." In contrast to the Jewish tradition, which uses a term which can be translated as a "box" or "chest" to describe the Ark, surah 29:14 refers to it as a safina, an ordinary ship, and surah 54:13 as "a thing of boards and nails." Surah 11:44 says it settled on Mount Judi, identified by tradition with a hill near the town of Jazirat ibn Umar on the east bank of the Tigris River in the province of Mosul in northern Iraq. `Abd Allah ibn `Abbas, a contemporary of Muhammad, wrote that Noah was in doubt as to what shape to make the Ark, and that Allah revealed to him that it was to be modeled after a bird's belly and fashioned of teak wood. Noah then planted a tree, which in 20 years had grown enough to provide him all the wood he needed. The Persian historian Muhammad ibn Jarir al-Tabari's History of the Prophets and Kings (c. 915) includes numerous details about Noah's Ark found nowhere else; for instance, he says that the first creature aboard was the ant, and the last was the donkey, by means of whom Satan came aboard. He also relates that when Jesus' apostles expressed a desire to learn about the Ark from an eye-witness, he responded by temporarily resurrecting Noah's son Ham from the dead, who told them more: to deal with the excessive dung, Noah had miraculously caused a pair of hogs to come out of the elephant's tail; and to deal with a stowaway rat, Noah caused a pair of cats to come from the lion's nose. Abu al-Hasan Ali ibn al-Husayn Masudi (d. 956) says that the spot where it came to rest could be seen in his time. Masudi also says that the Ark began its voyage at Kufa in central Iraq and sailed to Mekka, where it circled the Kaaba, before finally travelling to Judi. Surah 11:41 says: "And he said, 'Ride ye in it; in the Name of God it moves and stays!'" Abdallah ibn 'Umar al-Baidawi, writing in the thirteenth century, takes this to mean that Noah said, "In the Name of God!" when he wished the Ark to move, and the same when he wished it to stand still. The flood was sent by Allah in answer to Noah's prayer that this evil generation should be destroyed; yet as Noah was righteous he continued to preach, and 70 idolaters were converted and entered the Ark with him, bringing the total aboard to 78 humans (these 70 plus the eight members of Noah's own family). The 70 had no offspring, and all of post-flood humanity is descended from Noah's three sons. A fourth son (or a grandson, according to some) named Canaan was among the idolaters, and was drowned. Baidawi gives the length of the Ark as 300 cubits (157 m, 515 ft) by 50 (26.2 m, 86 ft) in width, 30 (15.7 m, 52 ft) in height, and explains that in the first of the three levels wild and domesticated animals were lodged, in the second the human beings, and in the third the birds. On every plank was the name of a prophet. Three missing planks, symbolizing three prophets, were brought from Egypt by Og, son of Anak, the only one of the giants permitted to survive the Flood. The body of Adam was carried in the middle to divide the men from the women. Noah spent five or six months aboard the Ark, at the end of which he sent out a raven. But the raven stopped to feast on carrion, and so Noah cursed it and sent out the dove, which has been known ever since as the friend of mankind. Masudi writes that God commanded the earth to absorb the water, and certain portions which were slow in obeying received salt water in punishment and so became dry and arid. The water which was not absorbed formed the seas, so that the waters of the flood still exist. Noah left the Ark on the tenth day of Muharram, and he and his family and companions built a town at the foot of Mount Judi named Thamanin ("eighty"), from their number. Noah then locked the Ark and entrusted the keys to Shem. 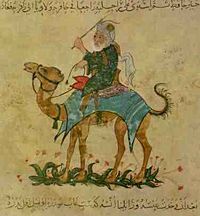 Yaqut al-Hamawi (1179–1229) mentions a mosque built by Noah which could be seen in his day, and Ibn Batutta passed the mountain on his travels in the fourteenth century. Modern Muslims, although not generally active in searching for the Ark, believe that it still exists on the high slopes of the mountain. The Mandaeans of the southern Iraqi marshes regard Noah as a prophet, while rejecting Abraham (and Jesus) as false prophets. In the version given in their scriptures, the ark was built of sandalwood from Jebel Harun and was cubic in shape, with a length, width and height of 30 gama (the length of an arm); its final resting place is said to be Egypt. The Yazidi of the Sinjar mountains north of Mosul practise a unique blend of indigenous and Islamic beliefs. According to their Mishefa Reş, the Deluge occurred not once, but twice. The original Deluge is said to have been survived by a certain Na'umi, father of Ham, whose ark landed at a place called Ain Sifni, in the region of Mosul. Some time after this came the second flood, upon the Yezidis only, which was survived by Noah, whose ship was pierced by a rock as it floated above Mount Sinjar, then went on to land on Mount Judi as described in Islamic tradition. According to Irish mythology, Noah had a son named Bith who was not allowed aboard the Ark, and who instead attempted to colonize Ireland with 54 persons, all of whom were then wiped out in the Deluge. The Bahá'í Faith states that the references to the Ark and the Flood in both the Bible and the Qur'an are symbolic. In Bahá'í belief, only Noah's followers were spiritually alive, preserved in the ark of his teachings, as others were spiritually dead. The Bahá'í scripture Kitáb-i-Íqán endorses the Islamic belief that Noah had a large number of companions, either 40 or 72, besides his family on the Ark, and that he taught for 950 years before the flood, though the years are not solar years and are symbolic. Paradisaea apoda, so named by naturalists because the first specimens to reach Europe were prepared as skins without the feet, with consequences for seventeenth century theories of exotic animals aboard the Ark. The Renaissance saw a continued speculation that might have seemed familiar to Origen and Augustine: What of the Phoenix, which is unique, how could it come in as a pair? (A popular solution was that it contained male and female in itself.) And might the Sirens, which by their nature lure sailors to their doom, have been permitted on board? (According to Athanasius Kircher, writing in 1675, they were.) And the bird of paradise, which was thought to have no feet—did it therefore fly endlessly inside the Ark? Yet at the same time, a new class of scholarship arose, one which, while never questioning the literal truth of the Ark story, began to speculate on the practical workings of Noah's vessel from within a purely naturalistic framework. Thus in the fifteenth century, Alfonso Tostada gave a detailed account of the logistics of the Ark, down to arrangements for the disposal of dung and the circulation of fresh air, and the noted sixteenth-century geometrician Johannes Buteo calculated the ship's internal dimensions, allowing room for Noah's grinding mills and smokeless ovens, a model widely adopted by other commentators. By the seventeenth century, it was becoming necessary to reconcile the exploration of the New World and increased awareness of the global distribution of species with the older belief that all life had sprung from a single point of origin on the slopes of Mount Ararat. The obvious answer was that man had spread over the continents following the destruction of the Tower of Babel and taken animals with him, yet some of the results seemed peculiar: why had the natives of North America taken rattlesnakes, but not horses, wondered Sir Thomas Browne in 1646? "How America abounded with Beasts of prey and noxious Animals, yet contained not in that necessary Creature, a Horse, is very strange". Browne, who was among the first to question the notion of spontaneous generation, was a medical doctor and amateur scientist making this observation in passing. Biblical scholars of the time such as Justus Lipsius (1547–1606) and Athanasius Kircher (c.1601 – 1680) were also beginning to subject the Ark story to rigorous scrutiny as they attempted to harmonize the Biblical account with natural historical knowledge. The resulting hypotheses were an important impetus to the study of the geographical distribution of plants and animals, and indirectly spurred the emergence of biogeography in the 18th century. Natural historians began to draw connections between climates and the animals and plants adapted to them. One influential theory held that the biblical Ararat was striped with varying climatic zones, and as climate changed, the associated animals moved as well, eventually spreading to repopulate the globe. There was also the problem of an ever-expanding number of known species: for Kircher and earlier natural historians, there was little problem finding room for all known animal species in the Ark, but by the time John Ray (1627–1705) was working, just several decades after Kircher, their number had increased dramatically. Incorporating the full range of animal diversity into the Ark story was becoming increasingly difficult, and by 1700 few natural historians could justify a literal interpretation of the Noah's Ark narrative. Torah scroll, open to the Song of the sea in Exodus 15: British Library Add. MS. 4,707. Since the Middle Ages, religious scholars had puzzled over the many apparent confusions and inconsistencies which mark the Bible. The Ark story seemed particularly rich in such problems: why, for example, does it state twice over that mankind had grown corrupt but that Noah was to be saved (Genesis 6:5-8; Genesis 6:11-13)? Was Noah commanded to take one pair of each clean animal into the Ark (Genesis 6:19-20) or seven pairs (Genesis 7:2-3)? Did the flood last forty days (Genesis 7:17) or a hundred and fifty days (Genesis 7:24)? How could the raven that was sent out from the Ark and "went to and fro until the waters had subsided from the face of the earth" survive the two to three weeks involved (Genesis 8:7)? And why does the narrative appear to have two logical end-points (Genesis 8:20-22 and Genesis 9:1-17)? 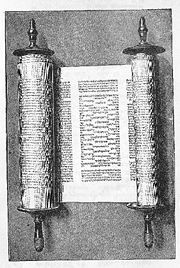 "Starting from the simple question of how to reconcile inconsistencies in the text, and refusing to accept forced explanations to harmonize them, scholars eventually arrived at the theory that the Torah was composed of selections woven together from several, at times inconsistent, sources dealing with the same and related subjects". The work of a century of these scholars was synthesized in 1886 by Julius Wellhausen in his Prolegomena zur Geschichte Israels ("Prolegomena to the History of Israel"). Wellhausen's basic thesis, known as the documentary hypothesis, is that the first five books of the Bible were composed from four originally independent source texts, no longer extant but reconstructed by the various theorists, and all composed within the last millennium before Christ, with the final unified version which we have today dating from the fifth century B.C.E. The theory further assumes that two of these four sources, each originally an independent and complete story in its own right, were interwoven to make the Ark and Flood story in Genesis 6-9. According to Wellhausen's version of the hypothesis, the Yahwist was the earlier source, composed in the kingdom of Judah soon after the separation of Judah and Israel c. 920 B.C.E. In the Yahwist story God sends his flood for forty days, Noah and his family and the animals are saved (seven pairs of each clean animal, a single pair for the unclean), Noah builds an altar and makes sacrifices, and God resolves never again to destroy the earth with a flood. The Yahwist source makes no mention of the covenant between God and Noah. Yahweh's decision to administer an exacting punishment for man's wickedness, and his later promises never again to repeat such punishment, are typical of the Jahwist, who treat God as a human-like figure who appears in person in the narrative, e.g., closing up the door of the Ark. The second source was the hypothetical Priestly text. Wellhausen believed this to have been composed in the mid-sixth century B.C.E., during the Babylonian exile; some modern scholars, notably Yehezkel Kaufmann and Richard Elliott Friedman, would place it earlier, in the late eighth century B.C.E. In either case, the scholars believe it to have been composed by the Aaronid priesthood of the Jerusalem temple, with the specific purpose of countering certain points in the Yahwist version. Yahweh, for the priests, was distant and unapproachable: Yahweh does not appear in person in their version. In particular, the priests regarded sacrifice as their prerogative: while the Jahwist allows Noah to make a sacrifice to Yahweh (and therefore requires seven pairs of each clean animal), the Priestly source reduces this to a single pair, as no sacrifices can be made under priestly rules until Aaron, the first priest, appears in Exodus. The Priestly source also provides the vital theological core of the story, the covenant between God and Noah at Genesis 9:1-17, which introduces the peculiarly Jewish method of ritual slaughter and forms the quid pro quo for God's promise not to destroy the world again. It is the Priestly source which gives us the raven (the Jahwist has the dove) and the rainbow, and which introduces the windows of heaven and the fountains of the deep (the Jahwist simply says that it rained). In recent decades the documentary hypothesis has been challenged by both by scholars who argue for the essential unity of the Pentateuch (though recognizing evidence of editorial redaction), and by scholars who allocate far later dates for Biblical texts than those advanced by previous generations of scholars, and who warn against accepting any text at face value. For example, archaeologist Kenneth Kitchen has argued that doublets and apparent contradictions of the Genesis flood narrative are in fact standard features of analogous Ancient Near East texts, and not indicative of multiple authors. Similarly, archaeologist James Hoffmeier notes that increasing understanding of Ancient Near East literary forms has resulted in the realization that the flood narrative is a literary unit. Other scholars point to the strong strand of Mesopotamian myth in Genesis (the creation stories, the story of the Tower of Babel, and many individual elements within these stories) as indicative that the Ark story was written was in Babylon, following the Babylonian conquest of Judah (587 B.C.E.). Faced with Babylonian stories about Babylonian gods creating and controlling the world (including a story about how the gods saved one man from a great flood), the exiled priests of Yahweh rewrote the myths of their conquerors to give primacy to Yahweh, effectively denying the power both of the Babylonians and of their divinities. Umberto Cassuto, Kenneth Kitchen, E. Nielsen and F.I. Andersen have all defended the unity of the Flood story, while Gordon Wenham, Old Testament scholar at the University of Gloucestershire, (1978) argues that the entire account is in the form of a single rhetorical figure known as a palistrophe, which could only have been composed as a unity. 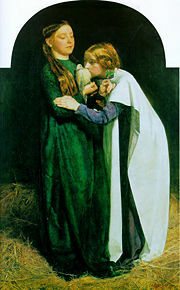 John Everett Millais: The Return of the Dove to the Ark (1851). According to a telephone poll conducted by ABCNEWS/Primetime in 2004, 60 percent of US residents believe the story of Noah's Ark is literally true. Biblical literalists tend to trust in traditions regarding the composition of the Bible and generally accept the traditional belief that the Ark narrative was written by Moses some time between the sixteenth century B.C.E. and late thirteenth century B.C.E. and describes a real event which took place in the fourth or third millennium before Christ. Biblical literalists explain apparent contradiction in the Ark narrative as the result of the stylistic conventions adopted by an ancient text: thus the confusion over whether Noah took seven pairs or only one pair of each clean animal into the Ark is explained as resulting from the author (Moses) first introducing the subject in general terms—seven pairs of clean animals—and then later, with much repetition, specifying that these animals entered the Ark in twos. Literalists see nothing puzzling in the reference to a raven flying over the Flood for two weeks—it could have rested on carrion floating on the waters—nor do they see any sign of alternative endings. Gopher wood: Gen 6:14 states that Noah built the Ark of גפר (gofer, more commonly gopher) wood, a word not otherwise known in the Bible or in Hebrew. The Jewish Encyclopedia believes it was most likely a translation of the Babylonian "gushure iş erini" (cedar-beams), or the Assyrian "giparu" (reed). The Greek Septuagint (3rd–1st centuries B.C.E.) translated it as ξύλων τετραγώνων ("xylon tetragonon"), "squared timber". Similarly, the Latin Vulgate (fifth century C.E.) rendered it as "lignis levigatis," or "smoothed (possibly planed) wood." Older English translations, including the King James Version (seventeenth century), simply leave it untranslated. Many modern translations tend to favor cypress (although the word for "cypress" in Biblical Hebrew is erez), on the basis of a mistaken etymology based on phonetic similarities, while others favor pine or cedar. Recent suggestions have included a lamination process, or a now-lost type of tree, or a mistaken transcription of the word kopher (pitch), but there is no consensus. Seaworthiness: Biblical literalists seem to agree that the Ark was approximately 450 feet (137 m) long. This is considerably larger than the schooner Wyoming, at 329 feet the largest timber-hulled vessel built in modern times. The Wyoming and similar ships of her class suffered chronic leaking, warping, and hull separation due to hogging and sagging, despite reinforcement with iron bracing. "The construction and use histories of these [i.e. modern timber-hulled] ships indicated that they were already pushing or had exceeded the practical limits for the size of wooden ships". In response to the claim that the Ark had to be seaworthy, literalist websites cite various studies which, in their view, indicate that Noah's Ark was seaworthy, including a Korean paper demonstrating that the dimensions, shape, and structural materials of the Ark are realistic and that the Ark 'had a superior level of safety in high winds and waves compared with the other hull forms studied'. In this regard, some apologists cite the Chinese Ming Dynasty 'Treasure ships', or baochuan (the largest of which are claimed to be 400 to 600 ft long), as examples of large seagoing wooden vessels: however, the actual size of these ships is disputed, and one explanation for their size is that the largest Treasure Ships were merely used by the Emperor and imperial bureaucrats to travel along the relatively calm Yangtze river. Some apologists claim that the Flood was merely a local phenomenon confined to Mesopotamia, and hence the Ark would not have needed to survive wave action on a worldwide ocean. Practicality: Were the technology and materials available to Noah to make the Ark's construction possible? 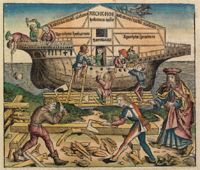 Ark-believers claim that there is ample evidence for ancient timber vessels comparable in size and construction to the Ark: Sir Walter Raleigh was among the first to argue that the Ark was smaller than the Syracusia, a cargo ship built in the third century B.C.E. during the reign of Hiero II of Syracuse (180 feet in length), and the giant warship Tessarakonteres built by Ptolemy IV Philopater. The Tessarakonteres (420 feet long, and recognized as a historical vessel by standard historical authorities, albeit with caveats regarding its practicality: Plutarch says "she was moved only with difficulty and danger"), remained a common point of comparison to the Ark throughout the nineteenth century among Flood-apologists, naval historians, nautical engineers, and scientific journals. Other ancient ships commonly used as points of comparison by modern Ark apologists are the giant obelisk barge of Hatshepsut (206-311 ft), the Thalamegos (377 ft), Caligula's Giant Ship (341 ft), and Caligula's Nemi Ships (229 ft), the historicity of which is accepted by standard historical authorities. Capacity and logistics: According to Ark dimensions commonly accepted by literalists, the Ark would have had a gross volume of about 1.5 million cubic feet (40,000 m³), a displacement a little less than half that of the Titanic at about 22,000 tons, and total floor space of around 100,000 square feet (9,300 m²). 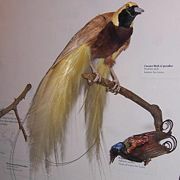 The question of whether it could have carried two (or more) specimens of the various species (including those now extinct), plus food and fresh water, is a matter of much debate, even bitter dispute, between Biblical literalists and their opponents. While some Biblical literalists hold that the Ark could have held all known species, a more common position today is that the Ark contained "kinds" rather than species—for instance, a male and female of the cat "kind" rather than representatives of tigers, lions, cougars, etc. The many associated questions include whether eight humans could have cared for the animals while also sailing the Ark, how the special dietary needs of some of the more exotic animals could have been catered for, how the creatures could have been prevented from preying on each other, questions of lighting, ventilation, and temperature control, hibernation, the survival and germination of seeds, the position of freshwater and saltwater fish, the question of what the animals would have eaten immediately after leaving the Ark, how they traveled (or were gathered) from all over the world to board the Ark and how they could have returned to their far-flung habitats across the Earth's bare, flood-devastated terrain, and how two or a few members of a species could have provided enough genetic variety to avoid inbreeding and reconstitute a healthy population. The numerous Biblical literalist websites, while agreeing that none of these problems is insurmountable, give varying answers on how to resolve them. For centuries, Mount Ararat (pictured here) has been searched for remains of Noah's ark. Recently Mount Sabalan in Iran, over 300 km (200 miles) away, has been under investigation. Believers in the historicity of the Genesis account feel that finding the Ark would validate their views on a whole range of matters, from geology to evolution. "If the flood of Noah indeed wiped out the entire human race and its civilization, as the Bible teaches, then the Ark constitutes the one remaining major link to the pre-flood World. No significant artifact could ever be of greater antiquity or importance… [with] tremendous potential impact on the creation-evolution (including theistic evolution) controversy". 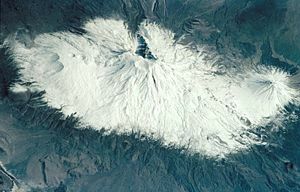 Searches have concentrated on Mount Ararat in Turkey itself, although Genesis actually refers only to the mountains of Ararat. The Durupinar site, near but not on Ararat, and much more accessible, attracted attention in the 1980s and 1990s; In early 2004 a Honolulu businessman traveled to Washington, DC to “announce with great fanfare” a planned expedition to investigate a site he called the Ararat anomaly but National Geographic later concluded it may have been an ineffective stunt to “persuade the Turkish government into granting him a permit” that “few expeditions have actually obtained.”; and in 2006 there was brief flurry of interest when an expedition reported a potential site in Iran. In 2007, a joint Turkish-Hong Kong expedition team found what is thought to be fossilized wood in a cave on Mount Ararat in Turkey. A sample of the "wood" was analyzed by the Department of Earth Sciences of the University of Hong Kong but the results were inconclusive. The origin of the out-crop remains unknown, but the group suggests that it is part of Noah's Ark. Photos of geologic thin-sections of the "wood" have been examined by several creationary geologists who concur that this is likely volcanic tuff. It has been suggested that the finding is a ploy to increase tourism in the area. ↑ Book of Genesis (Revised Standard Version). ↑ "…God's patience waited in the days of Noah, during the building of the ark, in which a few, that is, eight persons, were saved through water, baptism, which corresponds to this, now saves you." 1 Peter 3:20-21. ↑ Christ at the Second Coming would supposedly appear in the east. ↑ Legends of the Patriarchs and Prophets and Other Old Testament, by Sabine Baring-Gould - 1884 books.google. Retrieved February 8, 2009. ↑ Shoghi Effendi. Messages to the Bahá'í World, 1950–1957. (Wilmette, IL: Bahá'í Publishing Trust, 1971. ISBN 0877430365), 4. bahai.org. ↑ From a letter written on behalf of Shoghi Effendi to an individual believer, November 25, 1950. Published in Compilations |editor = Hornby, Helen (Ed.) |year = 1983 |title = Lights of Guidance: A Bahá'í Reference File |publisher = Bahá'í Publishing Trust, New Delhi, India |id = ISBN 8185091463 |url = pages = p. 494. ↑ 20.0 20.1 20.2 Richard Elliot Friedman. The Bible with Sources Revealed: A new view into the five books of Moses. (New York: Harper SanFrancisco, 2003. ISBN 006073065X). ↑ Gordon Wenham, "The Coherence of the Flood Narrative," Vestus Testamentum, 1978. See Wenham's footnotes for references to Cassuto and others. ↑ David Morris: Six in 10 Take Bible Stories Literally. ABC News, Telephone Poll February 6-10 2004. See also Surveyed Americans Believe in Biblical Truth. CBN News, December 22, 2007. ↑ Literalists rely on the internal biblical chronology to count backwards from the relatively secure dates in the historical books (largely the book of Kings, where events such as the destruction of Jerusalem by the Babylonians can be verified from non-biblical sources) to the genealogies contained in Genesis 5 and 11. Archbishop Ussher, using this method in the seventeenth century, arrived at 2349 B.C.E., and this date still has acceptance among many. A more recent Christian fundamentalist scholar, Gerhard F. Hasel, summarising the current state of thought in the light of the various Biblical manuscripts (the Masoretic text in Hebrew, various manuscripts of the Greek Septuagint), and differences of opinion over their correct interpretation, demonstrated that this method of analysis can date the flood only within a range between 3402 and 2462 B.C.E. GF Hasel, THE MEANING OF THE CHRONOGENEALOGIES OF GENESIS 5 AND 11. Origins 7 (2)(1980): 53–70. accessdate 2007-06-27. Other opinions, based on other sources and methodologies, lead to dates outside even this bracket—the deuterocanonical Book of Jubilees, for example, providing a date equivalent to 2309 B.C.E. ↑ Several Creationist websites give encyclopedic answers to the many questions asked about the Ark: see, for example, Trueorigin.org, "Problems with a Global Flood? ", and links in the See Also section of this article. ↑ How BIG was Noah's Ark? biblestudy.org. Retrieved February 8, 2009. ↑ Noah's Ark. Retrieved February 8, 2009. ↑ Yes, Noah did build an Ark!.creationontheweb. Retrieved February 8, 2009. ↑ Ark.worldwideflood.com. Retrieved February 8, 2009. ↑ Richard Gould, Asia's Undersea Archeology. PBS NOVA Retrieved February 8, 2009. ↑ The Archaeological Researches into Zheng He's Treasure Ships.travel-sildroad.com. Retrieved February 8, 2009. ↑ The Genesis Flood.bibleapologetics. Retrieved February 8, 2009. ↑ Did Noah Really Build An Ark? quote: 'It would have been about 450ft long, and experts say it would have broken apart'.BBC News. Retrieved February 8, 2009. ↑ Noah's Ark 'the odds are that the technology of the time and the reputed material (gopher wood or shittim wood = ?acacia) would have made such a structure too flimsy for the purpose' skepdic.com. Retrieved February 8, 2009. ↑ The large ships of antiquity.creationontheweb.com. ↑ Lionel Casson, The Age of the Supergalleys, Chapter 7 of Ships and Seafaring in Ancient Times. (University of Texas Press, 1994. ISBN 029271162X). ↑ Demetrius, 43:4-5 Retrieved February 8, 2009. ↑ Tim Lovett, May 2004,Noah's Ark: Impossible For Ancients?.worldwideflood.com. Retrieved February 8, 2009. ↑ The Genesis Flood bibleapologetics. ↑ 'It is estimated that the obelisk barge [of Hatshepsut] may have been over ninety-five metres in length and thirty-two metres wide', Technology along the Nile.ancientegyptmagazine.com. Bailey, Lloyd R. (1989). Noah, the Person and the Story. South Carolina: University of South Carolina Press. ISBN 0-87249-637-6. Best, Robert M. (1999). Noah's Ark and the Ziusudra Epic. Fort Myers, Florida: Enlil Press. ISBN 0-9667840-1-4. Brenton, Sir Lancelot C.L. (1986). The Septuagint with Apocrypha: Greek and English (reprint). Peabody: Hendrickson Publishers. ISBN 0-913573-44-2. Tigay, Jeffrey H., (1982). The Evolution of the Gilgamesh Epic. University of Pennsylvania Press, Philadelphia. ISBN 0-8122-7805-4. Woodmorappe, John (1996). Noah's Ark: A Feasibility Study. El Cajon, CA: Institute for Creation Research. ISBN 0-932766-41-2. Young, Davis A. (1995). The Biblical Flood. Grand Rapids, MI: Eerdmans Publishing Co.. ISBN 0-8028-0719-4. All links retrieved December 6, 2018. Problems with a Global Flood at TalkOrigins Archive. Problems with a Global Flood? Response to the above. Some Jewish Opinions on the Ark at Chabad.org. This page was last modified on 6 December 2018, at 17:22.